If you’ve succumbed to winter weight gain as status quo, it doesn’t have to be your destiny. While we will all probably overeat during the holidays, the rest of the winter doesn’t have to be spent feeling defeated by the season. You can lose weight and keep it off this winter. Exercising in the winter can be a challenge. It’s dark. It’s cold. It’s just not as easy to slip on your sneakers and go for a stroll. But exercise is not the only factor in the overall wellness equation. Eating healthy foods can help you achieve and maintain a healthy weight, while also helping you reduce your risk of heart disease, maintain your blood pressure and cholesterol levels, and give you energy—something we can all use in the winter. Having a well-stocked, healthy pantry and fridge, filled with nutritious options will take the guesswork out of meals and snacks. If your refrigerator is like most, the doors are crammed with bottles of condiments from you-can’t-remember-when with takeout containers past their prime lingering on the shelves. When you have nothing but delicious and healthy food at your fingertips—and at eye level—eating healthfully can be a cinch. According to a study conducted by Brian Wansink, Ph. D., director of Cornell University Food and Brand Lab, people who moved fruit and vegetables to the top shelf, rather than keeping them in the crisper, ate nearly three times more produce as they had previously. Here are some staples that are super-easy to keep on hand. 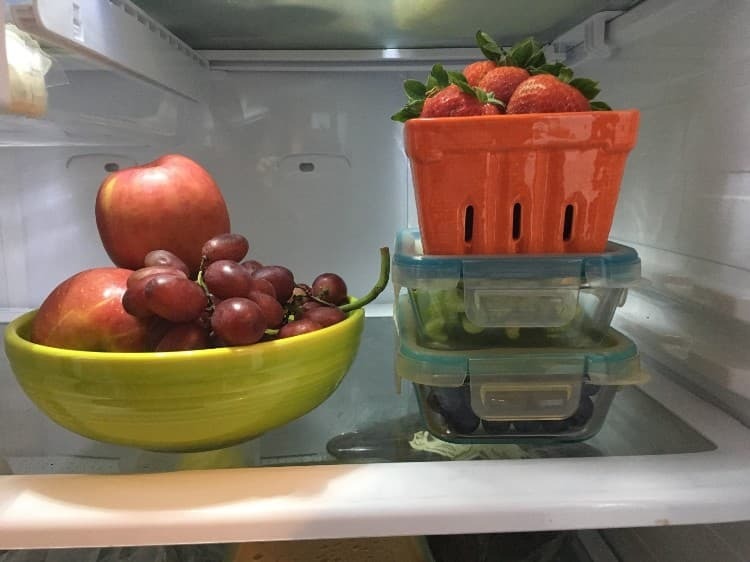 If your family is prone to standing with the refrigerator door open, wondering what there is to eat, a stash of ready-to-grab fruit at eye level will give you something healthy to munch on to keep cravings at bay. If you crave a crunch, keep some cut-up veggies in the grab-and-go zone. Cruciferous vegetables such as broccoli and cauliflower are high in vitamin C and may help ward off winter illness. Gale Pearson, a registered dietitian and certified diabetes educator, recommends portioning fruits and veggies in small bags or small clear containers. “It will be easier to grab a snack bag of veggies and fruit than chips and cookies,” she says. Go ahead and toss out the ranch, even if it came from some secret valley. Hummus is a low-fat snack that is rich in protein and makes a delicious dip and sandwich spread. Readily available in supermarkets, hummus is available in a ton of flavors, but it’s also super easy to make by whizzing up chickpeas, tahini, garlic, and lemon juice in a food processor. Pre-washed greens can be a terrific timesaver. Dark greens like baby spinach provide vitamins A, C, and K and are more versatile in the kitchen than their lighter hued kin. Not only does spinach a good salad make, enjoy it layered in sandwiches, wilted into an egg scramble, or whirred into a smoothie. Deli meats can be saturated with sodium, so your best bet is to make sandwiches and salads from your leftover roast chickens and turkeys. Keep plenty of skim or 1 percent milk on hand for cereal, smoothies, and milk mustaches-in-the-making. Cheese comes in all kinds of portable sizes now—sticks, wheels, and cubes—that are great for throwing into lunchboxes and brief cases. Cottage cheese is a powerful source of protein and calcium and an adaptable companion in both sweet and savory applications. Yogurt can be a tricky one. If you don’t watch the labels carefully, you can end up with the sugar and fat equivalent of a candy bar. Look for Greek yogurt with zero added sugar, artificial sweeteners, and fat. Rich in probiotics, yogurt may help reduce the duration and incidence of colds. For an extra shot of vitamin C and antioxidants, pair it with berries for a delicious parfait. Be sure to keep some plain yogurt on hand as a simple swap for mayo or sour cream. Salsa is a healthy dip, mustard is a low-fat sandwich spread, and low-sugar fruit preserves are a sweet spread on toast or stir-in for oatmeal. If you learn to make your own salad dressing, you may never buy the stuff at the store again. Just add two parts olive oil to one part vinegar, salt, pepper, and your favorite herbs and spices to a jar and shake vigorously. Voila. Store leftovers in the refrigerator. Your freezer can be your friend when planning for the long haul and last-minute dinners, alike. 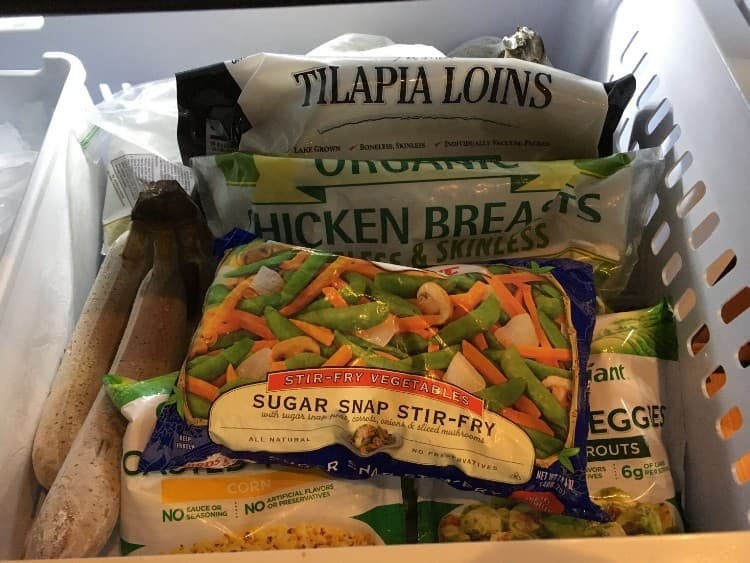 When you say goodbye to the giant tub of ice cream and chuck the chicken nuggets, you will have plenty of room for a healthy freezer, filled with a plethora of appetizing options. You may have been hardwired to believe that only fresh fruits and vegetables are nutritious. Turns out, frozen foods can be a close second, or even preferred, to fresh depending on the season. Frozen fruits and vegetables are generally flash-frozen immediately after harvest, so they can be fresher than the produce that sits on the store shelves. Frozen fruit can be thrown into a smoothie, yogurt, or hot or cold cereal. Frozen vegetables like to be steamed, roasted, and stir fried. As versatile as ground beef, but with less fat, lean ground turkey is a superstar in chilis, meatballs, pasta sauce, tacos, sloppy joes, and more. We’re talking about filets—not sticks—of fish. Without breading. Fish is delicious, nutritious, and cooks quickly, making it a quick weeknight dinner option and a healthy freezer staple. Fish is a good source of omega-3 fatty acids that benefit the heart, which is why it is recommended that we eat two servings per week. When the bananas on your counter are getting too speckled to eat, throw then in your freezer, peel and all. You can throw them into smoothies later or make your own banana ice cream for a dairy-free treat. To make 2-ingredient banana ice cream: peel and cut 2 frozen bananas into 2-inch chunks. Add 1 tablespoon peanut or other nut butter. Puree in food processor until smooth. Best eaten immediately. Chicken is the most versatile dinner protein and a must in any healthy freezer. Choose boneless, skinless breasts or thighs. Both are super sources of lean protein, but thighs are dark meat with a higher fat content, so they yield greater flavor and won’t dry out as easily as chicken breasts. Boxes, and cans, and junk food, oh my! It’s easy to fill your pantry with sugary cereals, salty snacks, sodium-laden soups, and things you have long forgotten about. 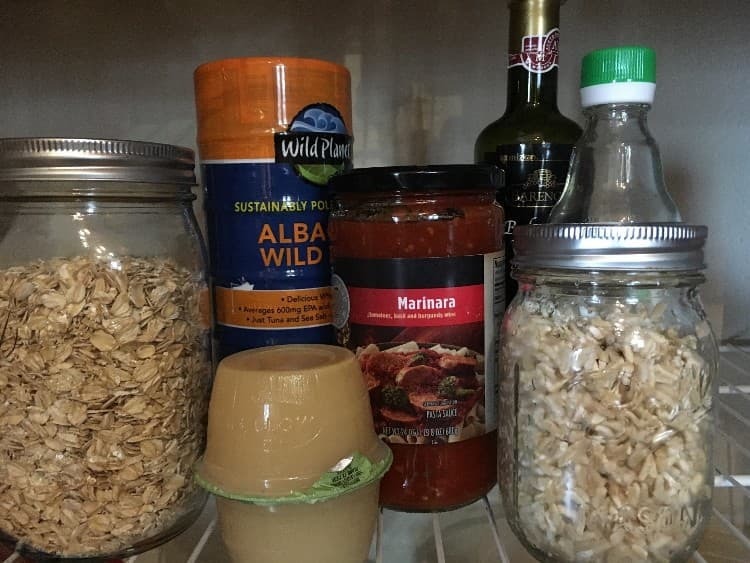 If your goal is to make your pantry a safe haven where anything you grab is golden, here are some suggestions on how to fill ‘er up. Abundant in plant-based protein, nutrient-dense beans are the unsung hero of the pantry. A frugal way to stretch meat in chilis and tacos, beans add heartiness to soups, and punch up the protein when tossed into salads. Oatmeal is an excellent source of fiber and protein, as well as zinc, which is important for proper immune function. Bonus: it also keeps you full long into your morning. If you like the smooth texture of instant oatmeal, go with unflavored and add your own fruit, preserves, nut butter or other add-ins. Steel cut oats take longer to cook than instant, but offer amped up texture and flavor. Canned albacore tuna in water is a convenient source of protein and omega-3 fatty acids that can help you stay happy and healthy in the winter. But don’t box yourself in by thinking that canned tuna has to be bathed in mayo and slathered on white bread. Try mixing it up with plain yogurt or cottage cheese and a dash of Dijon, then spread it on whole wheat bread or crackers. Or leave it plain and flake it into your salads or tacos. Unsweetened applesauce is a super snack on-the-run and fat and oil substitute in your winter baking. Brown rice is inexpensive, an excellent source of vitamins and minerals, and rich in complex carbohydrates, which just might make you feel good in the winter. This pantry-friendly staple is also filled with fiber to keep you full for a long time. Try it on its own with a splash of soy sauce or bedded underneath stir-fried veggies and lean meats. Storage tip: brown rice should be stored in an airtight container in a cool, dark pantry for up to six months. If you plan to hang on to it longer than that, it should be stored in the refrigerator or freezer. As with all pre-packaged foods, steer clear of the known suspects like sugar and sodium and choose options filled with fiber. Sally Kuzemchak, RD, recommends bread and crackers with at least 2 grams of fiber, and cereal with at least 3 grams of fiber. Pasta sauce is a portal to a slew of healthy meals, and a fantastic foil for vegetables when you add in easy-to-hide shredded carrots and zucchini. Select the varieties that have few ingredients and little sugar. Peanut and almond butter provides healthy fats and protein. Both are equally delicious spread on toast, added in to smoothies, and smeared on celery. Balsamic, apple cider, rice, and white wine vinegar are all great to have on hand for splashing into your homemade salad dressing or adding to marinades and sauces. Your spice cabinet can be the key to adding flavor—not fat or salt— to your dishes. Consider stocking up on basil, black pepper, cayenne pepper, chili powder, cinnamon, cumin, garlic powder, ginger, nutmeg, onion powder, oregano, red pepper flakes, and thyme. If winter weight gain is a challenge for you, kick it to the curb once and for all. Diet and exercise aren’t the only fail-safe methods. Why not amp up your efforts and enlist the help of weight loss medication? Alli is an OTC diet pill that when combined with a low-calorie diet and exercise can help you lose weight and prevent you from regaining the weight you’ve lost. Win-win, right? Xenical is available by prescription and is used to treat obesity. When used in combination with a reduced-calorie diet and exercise, Xenical helps people who are overweight lose weight. Filling your kitchen with delicious and healthy foods can take the pressure off snack and meal times when all your choices are good ones. Give yourself the go-ahead to clear out the junk food and stock your fridge, freezer, and pantry with a variety of foods that will have you family feeling fit and fantastic this winter. Tell us what your go-to healthy fridge, pantry, and freezer foods are on Facebook and Twitter. Cara Lanz is from the Brainerd lakes area of Minnesota. When she isn’t writing about health, fitness, food, and finances, she can be found on the lakes and trails of central Minnesota. Learn more about her at caralanz.com or follow her on Instagram.